I’m a smart, well-read, well-educated guy (modest, too) and relished talking with many hundreds of my fellow secular humanists and atheists before, during, and since those periods. I thought I would be justified by now in thinking that I honestly did not have much to learn about atheism and religion anymore. It gives me great pleasure to tell you I was wrong. Anyone who has even a passing interest in religion or atheism has much—interesting things, important things, fun things—to learn from the writers included in this book. If you, even you the longtime student of (and activist for or against) atheism over there in the corner, think you don’t have something to learn by reading these essays, think again. Learn, with zesty delight, how yoga and atheism relate (thanks to Suzanne Titkemeyer), how American military troops and leaders are twisted by religion, how real conversions from Christianity to atheism come about (hint: it’s not just rebelling against “proper” authority), how the claimed omniscience of God renders him impotent, and so much more. Laughs are also abundantly available. There are two groups of people who owe it to themselves to read this book: 1. Thoughtful atheists who want to understand more about their irreligious conclusions from a wide variety of practical, moral, and philosophical perspectives; and 2. Thoughtful theists who really want to understand more about their religious conclusions and to learn why thoughtful atheists wisely don’t accept those religious conclusions (or, often enough, don’t even consider the religious conclusions reasonable). Those two categories surely include millions of potential readers but not everyone. Atheists blasé enough to hold an important conclusion or lack of belief without Socrates’s famous imperative to make life worthwhile by examining such things can ignore all this. Theists who ignore this book can meander through life, wasting time, focus, money, and energy shoring up religious leaders and institutions when there are far better ways to live. The latter can even be smug, as long as no one has ever introduced them to the gospel (the real “good news” conveyed in these pages). Atheists can even learn how we might be blindly (religiously?) following Richard Dawkins and not know it, or that we really shouldn’t consider theists “stupid” or see religion as a “mental illness.” If these things puzzle or irritate you, blame Matthew Facciani, not me. Facciani is also the one who can sort you out on why a detective agency and agency detection aren’t the same animal. An ability to peer fearlessly into the future and map out clearly what’s to come (or at least to provide a reasonable, plausible facsimile thereof), whether by Citizen Hank Fox, Dale McGowan, or others less explicitly focused on what’s to come. The all-over-the map nature of these writers also applies to them pretty literally. Jonathan Pearce, the editor (and chief contributor), is a Brit, while most of the others are in one sense or another widely spread out Yanks, but there is nevertheless geographic diversity. Suzanne Titkemeyer represents Costa Rica (oh, OK—she never even mentions Costa Rica in her essay, but she lives there now, so that counts, right?). More serious diversity comes from Ghana (thanks to an Old South Alabaman-American, Warren Tidwell), from Jonny Scaramanga (who, like Pearce, toils primarily in the fertile fields of the United Kingdom, and from Luciano Gonzales, and from Kaveh Mousavi. Like all Puerto Ricans, Gonzalez qualifies as a Yank, but he also represents an unusual perspective for an American atheist. He does not restrict himself to Puerto Rico but analyzes atheism and religion throughout Latin America (or Hispanic America, if you prefer). Gonzalez is also a bilingual punster. Mousavi is another clear-headed, clear-thinking-and-writing contributor and he adds to the geographic diversity (he’s an Iranian living in Iran) but more crucially he enlarges the perspectives regarding religion (most of the other contributors primarily address Christianity). Mousavi is not the only contributor to touch on Islam, of course, but his is the most direct, forceful, effective take on the marriage—a bad one, for those of us who’re atheists but also for anyone committed to religious liberty—between Islam and politics or government. He’s not optimistic about the chances for an amicable divorce, either. As you’d expect, there is plenty of attention paid in these pages to connections among children, parents, science, and atheism vs. religion. And toys and God. And if you’ve never quite understood that whole “it’s not a religion—it’s a personal relationship with Jesus” trope, Neil Carter will sort you out in ways that perhaps only he and “Buzz Lightyear” can grasp. Stephanie Savage has a nice metaphor about the parallels between second-hand smoke and religion, while Michael Stone, citing Richard Dawkins and others (Dawkins has promoted similar ideas at least since The God Delusion ), makes a convincing case that teaching “scientific” creationism to children is a form of child abuse as well as an abuse of science. Alan Duval makes a much broader, more philosophical, case about the importance of protecting our future and our children from religious nonsense. Hank Fox offers a clarion call to protect our future—our children and our culture—from religion-based dishonesty and depredations. Readers, atheists and theists alike, should beware of presumptions. 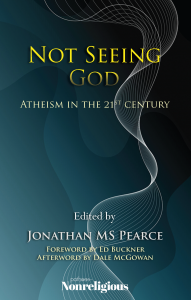 As with many other atheist writings, there’s plenty here to refute theistic claims (philosophical, social, psychological, and moral), but Jonathan Pearce, Bob Seidensticker, and several others lay out cogent arguments for atheism as well as shredding theistic claims. And Savage can fill you in on the plain fact that mythology is a communicable disease. Martin Hughes discusses, eloquently, the fact that atheists who leave a religion can—unintentionally—hurt family and friends. Galen Broaddus makes the strong case that atheists need and should have access to rituals and ceremony, and that these can be powerful without any god-talk whatsoever. Many contributors—especially Dan Fincke, but also Burrello, Duval, and others—bring fresh insights to the ancient questions supposedly raised by the connections of morality and religiosity. Probably my personal favorite subject that intersects with atheism—secularism—gets strong analysis by Kevin Davis as a blogger on secularism on Patheos, for which I here give him gratitude and respect—though his essay in this book is focused more on prayer, support for his premature baby, and a moving story about presumptions and a nurse. Secularism is defended or at least touched on by many of these writers, probably most strikingly by Mousavi (who doesn’t use the term but provides cogent examples for its need), Mehta (who ties it directly to American politics and voting), and Tsipursky (who explains the necessary connections among morality, ethics, government, and rationality). After decades of conversations with atheists and theists (mostly but not all Christians), I can attest that this book is much needed by atheists—many of whom will read it—and by religious believers, few of whom will. Misconceptions, misunderstandings, and even outright lies about atheism—about silly things and deadly serious things—pervade the globe (unevenly, to be sure). Far too many atheists might reasonably be called “unexamining atheists” (mostly from isolation rather than from willful ignorance). These atheists often seem to be people who cannot bring themselves to swallow the preposterous claims of believers but who nevertheless remain defensive or even afraid. Ignorance stands in those atheists’ way and only the kind of understanding that writers like the contributors here can supply can lead them to kind of lives they want and deserve. Many of these “unexamining atheists” think, I’ve discovered, that they are alone or in a tiny, weird minority. These atheists need to grasp the richness—the incredible diversity of opinions, experiences, and approaches—shown by this book, and to give up false notions of atheism as monolithic, immoral, or illogical. Peace of mind and deep satisfaction await. The absurd, false ideas about atheism held by billions of human beings could be largely rebutted and eliminated if all the believers would read these essays with an open mind. That won’t happen, but there may be hopes of nudging some significant fraction of them toward the light. And the atheists who read this book will be incomparably better prepared to enlighten those believers in their own lives (at least the ones who will read or hear). Humankind’s future literally depends on more rationality, more humanistic ways, and more applied intelligence. This book offers real help with all three. Writers like Jeana Jorgensen, Warren Tidwell (one of my heroes, if you must know—a near-perfect example of a man who thinks that humanism means more than anything else that our fellow humans deserve our help), Kathleen Johnson (another hero and another person I’m proud to call friend), Hemant Mehta (a friend, I think and hope), Neil Carter, and Andrew Spitznas all come at all this in ways, personal or academic, quite different from my own. They show how atheism and misconceptions about atheism and religion are worth examining with tools from anthropology, sociology, art (especially film), politics (electoral and intra-organizational), cultural and philanthropic activism, military organizations, and psychology. Time to start reading a fascinating, interesting, useful book. Oddly enough, you’d do well to start with the afterword (just to get an idea where all the writers are headed), by probably the best writer (and speaker—never miss a chance to hear a talk from him) in the movement in America, Dale McGowan. Wherever you start, you’re in for a series of treats, so enjoy.